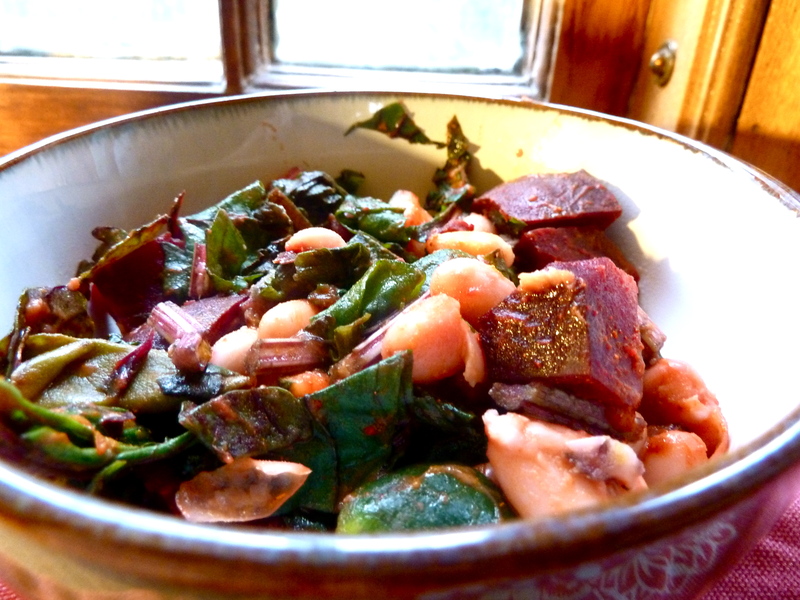 Rustic Beet, Zucchini, & White Bean Bowl – .rebel grrrl living. Hi friends. Thanks for all the love on the yoga teacher training post! I look forward to bringing you more information, but until then, enjoy this awesome dinner recipe I put together last week. This dish is the epitome of layers of flavor. A pop of citrus, followed by the smooth hum of turmeric and paprika, then a moment later, a kick of spice from the red pepper flakes. And the most powerful flavor of all? The farm fresh veggies! You can make these with store-bought beets and zuccs, but I promise you, the local stuff will taste better! And the coolest part is that–other than the hard stub at the end of the zucchini–you’ll have nothing to throw away! 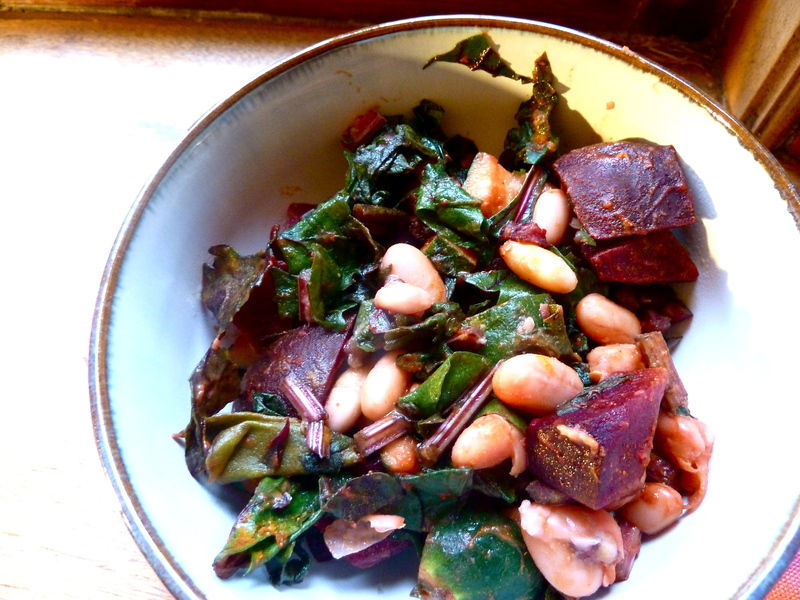 Eat those beet greens! They are full of vitamins and delicious. Get a medium-size pan set up to steam (fill 1/4 pot with water, place metal steamer in). Heat over high heat, bringing water to a boil. Chop your beets and zucchini into small bite-size pieces, then place them in the steamer for about 20-25 minutes (depending on how hard your beets are). Next, chop the beet stems and greens into bite size pieces. Rinse and drain your canned white beans. 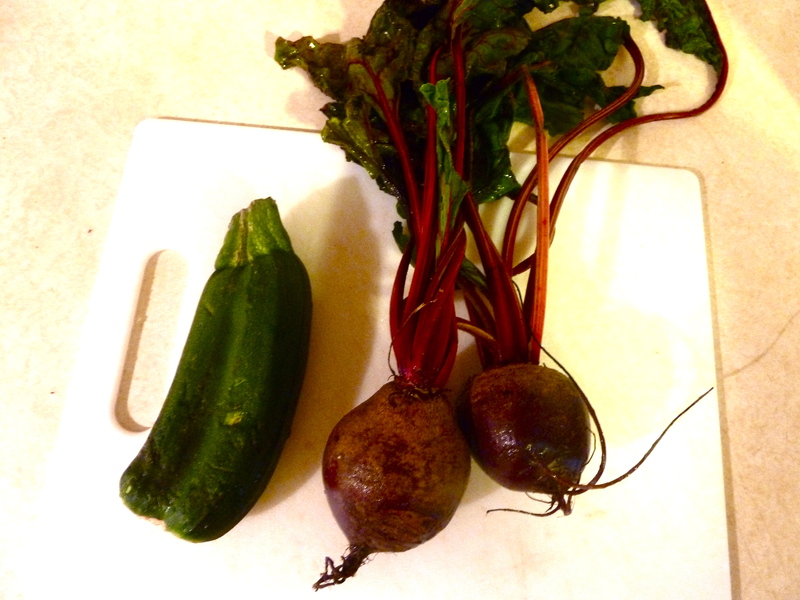 When veggies are tender, drain the water, then mix your beans, beets/beet greens and stems, and zucchini to the pot. Mix the olive oil, basil, and spices. Squeeze juice from 1/2 a lemon, then zest as much of the peel as you’d like. Mix together so everything is coated. Serve warm and enjoy! In other news, this week has been pretty a-okay. The 21 Day Meditation Challenge is going really well, I’ve gotten some good writing/work done, and my days have been filled with some of my favorite people. Not too shabby! How about you? How’s your week going? Do you love beets? Do you also get excited when you get to eat all parts of a vegetable?! EJP loves a beet! This looks amazing. YUM…. this is totally my kinda dish… simple, flavourful – respecting the glorious flavours that nature gives us, huh? Awesome! i LOVE beets. this looks awesome. Thanks for sharing this on Healthy Vegan Fridays Raechel! The flavours sound so fresh and I can only imagine how good those farm-fresh veggie taste!